Allergy free cereal bars are a grandma’s delight because they don’t require special ingredients and they can be made quickly for last minute visitors. Not only that but they’re a treat kids love! The plain version is a tasty treat but can also be a blank canvas for decorations for whatever occasion you’re celebrating. Chocolate drizzle, colored frosting, sprinkles that go with the celebration theme are all decorating options. Making these allergy free cereal bars really doesn’t require any special, difficult to find ingredients (or advanced cooking skills for that matter). 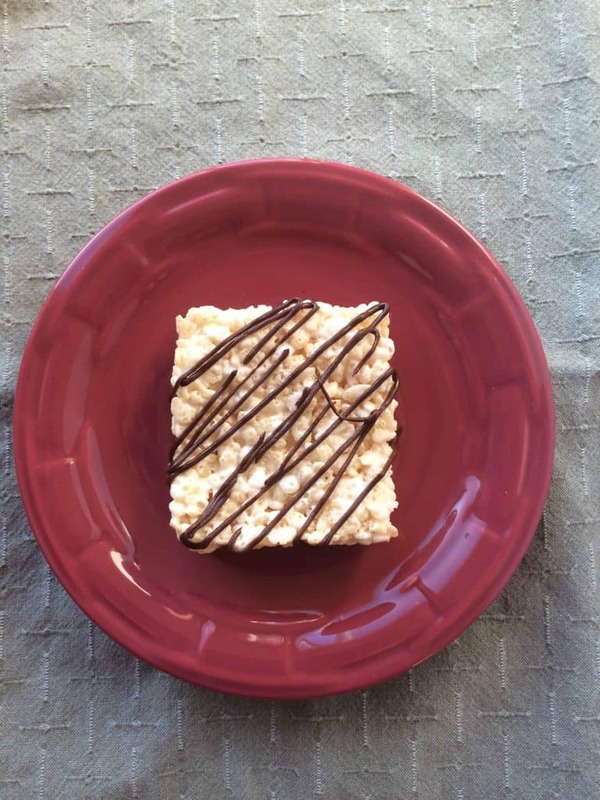 In fact, this recipe really doesn’t stray too much from the classic Rice Krispie bars that I made as a kid. Instead of butter, I use canola oil or Earth Balance Buttery spread. I have also used coconut oil which gives these bars a delicious flavor. Just be sure coconut oil is safe for you. If I can’t find gluten free crispy rice cereal, I usually use Rice Chex but you really could use any cereal that you like and that is free of your allergens. I try to keep these ingredients stocked in my pantry so I can whip up a batch for last minute gatherings or just an after school treat. They really couldn’t be simpler. And decorating them can be a lot of fun, too. 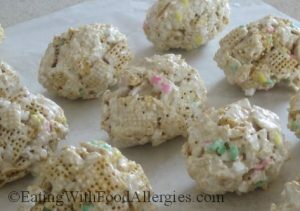 For Easter, I added pastel sprinkles (about 1/4 cup) to the mixture and formed them into egg shapes (I used a 1/3 cup measure) with my hands. If you try this, put a little water or cooking spray on your hands to keep them from sticking. 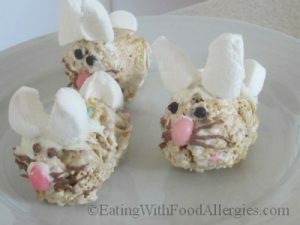 After I made the eggs, I thought maybe I should try to make them into bunnies (yes, I really like to play with my food!) These aren’t too pretty but you get the idea! 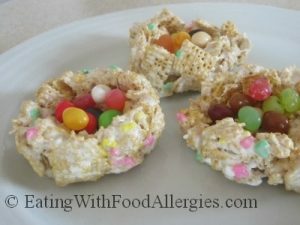 And I also made bird’s nests with jelly bean “eggs’. Use your imagination and have fun with it! 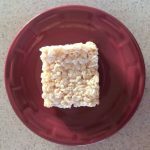 Allergy free cereal bars are a simple to make treat and they're dairy free, egg free, soy free, wheat/gluten free, peanut free, and tree nut free. In a large, microwaveable bowl melt the margarine (if using oil, skip this step). Combine the marshmallows and oil or melted margarine; toss to coat. Microwave on HIGH for 1 minute or until the marshmallows just start to expand. Remove from the microwave and stir the mixture until smooth. Add the cereal (and sprinkles if desired) and stir until it is evenly coated with the marshmallow mixture. Pour mixture into a 9x13 inch pan and press firmly to the edges using a rubber spatula.